Unlike students in other majors, who are writing final papers or studying for exams, art students at UC Santa Cruz are binding photo books and installing paintings for a department-wide gallery known as Open Studios. The Elena Baskin Visual Arts Center will be transformed into a gallery for a student showcase this Friday from 12-4 p.m. for the quarterly event. Participating in Open Studios is required for most art classes as a portion of students’ final grades in lieu of an exam or paper. Student work is displayed according to specific art courses and is usually housed by the studio or classroom that supports it. While photography classrooms are lined with photographs on the walls and have tables in the center displaying photo books, the painting studio is decorated with large canvases and couches for viewers sit in the center. Other mediums from the 25 art classes display drawings, sculptures, intermedia, print and electronic art. The basic principle of Open Studios is to teach students how to present their ideas for an audience, Locks said. 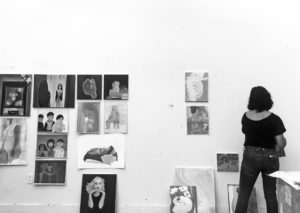 Gallery presentation is the main practice for showing art; Open Studios provides students with the opportunity to become accustomed to the professional process — creation, curation and installation. To become a working artist, Locks said, students must be exposed to the successes and failures that come with showing on a large scale. Spring quarter additionally features the annual UCSC Student Print Sale, held this Friday and Saturday from 10 a.m. to 6 p.m. in Room G-101 at the Elena Baskin Visual Arts Printmaking Studio. This event has been running for 43 years as an opportunity for students to sell their work. Print media includes etchings, lithographs, woodcuts, linoleum, digital prints and handmade books. While most classes require lab fees or textbooks, art students pay material fees and buy supplies. Costs of supplies can get expensive; copper plates for printmaking can range from $15-$130 and print paper rolls cost nearly $150. All profits from the print sale benefit the student artists and 20 percent of the proceeds are returned to the art department’s facilities. Casey is participating in their second print sale and said this event is not only helpful to fund their art but to develop marketing and self-employment skills. 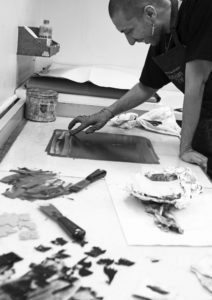 Casey believes a benefit of printmaking is the ability to produce and sell multiple prints. Last year Casey successfully sold about one-third of their prints. Prints vary in price depending on the size, medium and layering of the print. 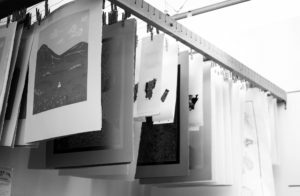 The annual print sale and quarterly Open Studios provide numerous opportunities for students to practice skills including curation, marketing and completing the creative process. Third-year photography student Kenny Rapaport said he learned how to present his work to an audience beyond just his ideas. Spring Open Studios also includes a senior celebration to honor graduating artists. Rapaport reflected on how the experience of Open Studios has changed for him from his freshman year to now as he advanced in his art studies.